Formerly known as The Regent Hong Kong, this hotel lies in the centre of the popular shopping and business area of Tsim Sha Tsui in Kowloon. 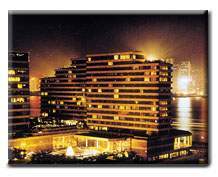 The hotel is positioned right on the edge of Victoria Harbour with spectacular views of Hong Kong Island and Victoria Harbour. Adjacent to the Hong Kong Space Museum, Museum of Art and Cultural Centre, the hotel is a ten minute walk to the Star Ferry, Harbour City Shopping Centre and the closest MTR subway station. The Spa features a full range of body and facial treatments. Specialty treatments include Jet-lag Relief and Oriental Healing. The hotel boasts five internationally acclaimed restaurants, including Plume,Yan Toh Heen, Y? Steak House Bar & Grill and Harbourside.